5These authors contributed equally to the work of this paper. 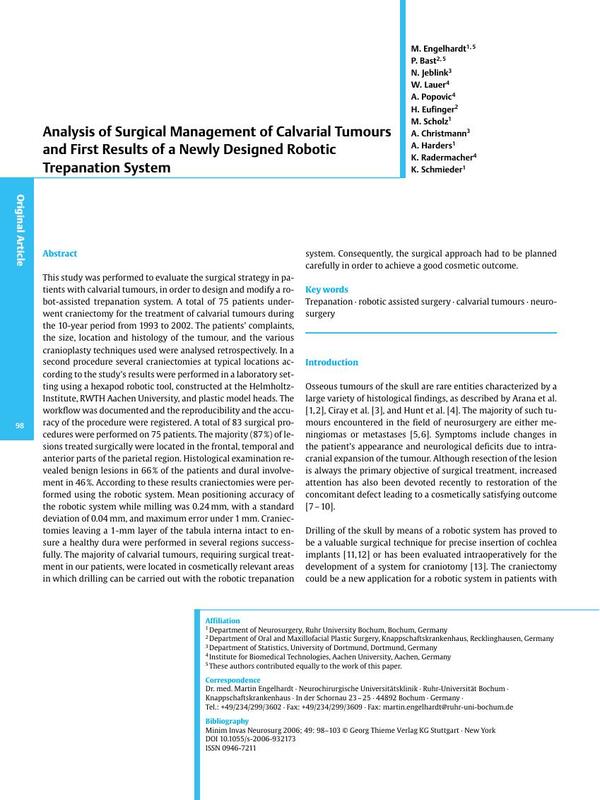 This study was performed to evaluate the surgical strategy in patients with calvarial tumours, in order to design and modify a robot-assisted trepanation system. A total of 75 patients underwent craniectomy for the treatment of calvarial tumours during the 10-year period from 1993 to 2002. The patients’ complaints, the size, location and histology of the tumour, and the various cranioplasty techniques used were analysed retrospectively. In a second procedure several craniectomies at typical locations according to the study’s results were performed in a laboratory setting using a hexapod robotic tool, constructed at the Helmholtz-Institute, RWTH Aachen University, and plastic model heads. The workflow was documented and the reproducibility and the accuracy of the procedure were registered. A total of 83 surgical procedures were performed on 75 patients. The majority (87 %) of lesions treated surgically were located in the frontal, temporal and anterior parts of the parietal region. Histological examination revealed benign lesions in 66 % of the patients and dural involvement in 46 %. According to these results craniectomies were performed using the robotic system. Mean positioning accuracy of the robotic system while milling was 0.24 mm, with a standard deviation of 0.04 mm, and maximum error under 1 mm. Craniectomies leaving a 1-mm layer of the tabula interna intact to ensure a healthy dura were performed in several regions successfully. The majority of calvarial tumours, requiring surgical treatment in our patients, were located in cosmetically relevant areas in which drilling can be carried out with the robotic trepanation system. Consequently, the surgical approach had to be planned carefully in order to achieve a good cosmetic outcome.